The purpose of this report is to estimate the total sales that stand to be lost because items are understocked. This report lists every item whose stock is currently zero and its Minimum, i.e. the number of items that should be in stock. (The Minimums are calculated beforehand with the parameters of the user's choice). The item shows the list price for each item (note that the items in this report appear in Mexican pesos, not US dollars) and the total potential sale (the Minimum multiplied by the list price). 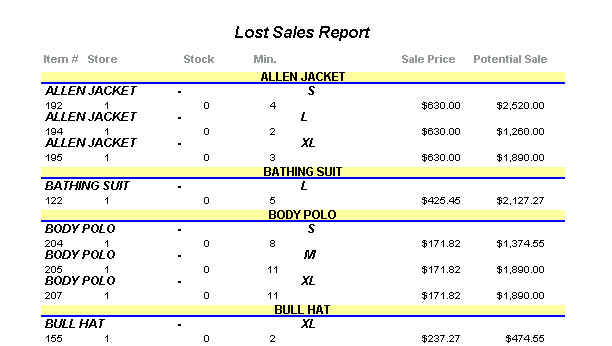 For this report, the Minimums were calculated using 45 days of sales so that, in this case, 11 medium body polos were sold in the last 45 days. Chances are, customer's will want to buy 11 more medium body polos in the next 45 days. Since each body polo sells for $425 pesos, the 11 medium body polos that could be sold represent $1,890 pesos in potentail sales that will be lost since there are currently none in stock. 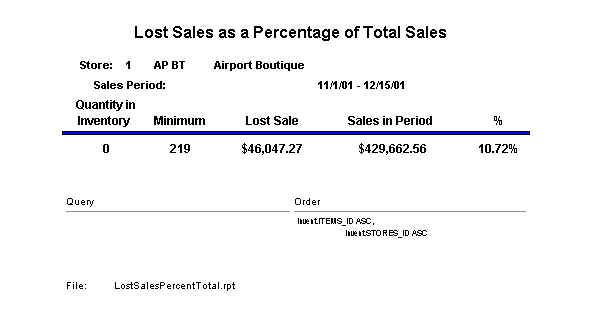 There is a companion report which takes the total of all lost sales as a a percantage of the total sales during the period which was used to calculate the Minimums, in this case November 1 - December 15, 2001. In the image below we can see that lost sales are equal to nearly 11% of the value of all sales during this period. The good news about this report is that it is preventative: the sales have not been lost yet. Rather, the report gives us a snapshot of all sales that stand to be lost if we do not restock to cover Minimums. The goal is to reduce this percentage as much as possible; this report helps us track our progress. There is a similar pair of reports that widens the concept from items with zero items in stock to all items whose stock is below their Minimum. The report calculates the amount of items understocked--the difference between the Minimum and stock onhand--and multiplies this number by the list price of the item to reach a total for sales potentially lost. While the total from the previous pair of reports gives us a lower bound of sales which will be lost due to understocking, this report defines the upper bound.